When I heard that there was a new Bridget Jones book coming out, I was surprised but quite excited. Then I found out that Mark Darcy was not in the book, and I was really upset. Really upset. Seriously, when a story is supposed to end in Happily Ever After, why can't people just leave well enough alone and let those characters actually live as they are supposed to?! 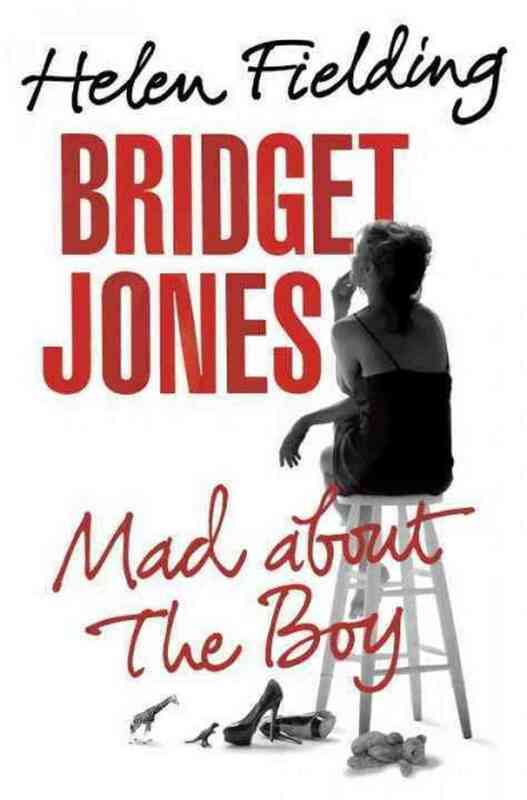 Anyway, so going into Bridget Jones: Mad about the Boy, I probably was not in the best state of mind. I wanted to have read the book, but I wasn't particularly excited about actually reading it. And the whole way through, I found it completely disappointing. Bridget is now 51 years old, a single mom with two young children. She is independently wealthy and she has no job, though sometimes she spends time working on screenplays. Apparently, because of this screen play "work," she requires the services of a full-time nanny who is good at everything. Her friends tell her it's time she starts dating again, so she goes on a self-improvement plan that involves losing 40 pounds in less time than it takes me to lose 4, joining Twitter, dating a man 20 years younger than her, and going out on the town wearing a short dress and thigh boots. Also, she's still the mess that she was when she was 30. I don't know many 50-year-old women except for those that I work with, and none of them are anything like Bridget. The character has in zero ways developed, maturity-wise or organization-wise or any-wise, since the last book, even though she has two children and has gone through quite a bit. Also her 30-year-old "toyboy" says things like, "I heart you" with true sincerity which is completely ridiculous and hard not to laugh at and I know many 30-year-old men and none of them would ever use the phrase "I heart you" ever. In reading reviews all over the internet, I see this book is very polarizing. People either seem to love it or hate it. I definitely fall into the latter camp. I really missed Mark Darcy, and I know that life isn't always rainbows and unicorns and that we need to be more realistic about the fact that horrible things happen, but... well, Bridget doesn't have a very realistic life at all, so if you're going to be realistic about some things, then you should be realistic about the others, too. It's unfortunate because there are some good nuggets here. Bridget trying to re-enter the dating world at 50 years old with two young children is a situation that I think many women deal with, and to see her laugh and cry her way through can be quite fun at times. And there are some really beautiful moments of being a single mom struggling through the holidays and trying to be brave for her children when she just wants to curl up and die. There is heart in this book, but just not enough of it. I think I will stay away from it. I enjoyed the first Bridget Jones book, and have the second on my must-read list. I guess I'll end my series reading there. I would get very upset about Bridget's lack of character development. I haven't read that many responses to the book and just heard an interview with the author the other day on the NYT podcast (I'm dreadfully behind in my listening! ), so it still seems like a "new book" to me and I haven't thought much about it. But I can imagine that would be very disappointing if you hadn't realized MD wasn't in the novel (they thoroughly SPOILED that bit in the interview, without any warning, because it had apparently been front-page news in England so it was assumed common knowledge). I'm not sure if I'll read the third or not, but I remain rather curious. I loved the first Bridget Jones book--it was so funny and smart. But aside from a couple of scenes, I hated the second book. I wanted her to have grown a little instead of wallowing in her insecurities. For me, part of the point of the first book was that she was better than her goof-ups that she tended to dwell on in her diary. Making her goof-ups the near sum-total of her personality undercut that idea that she was more competent and appealing than she realized. So I've had no interest in reading this, and what you say here confirms that I'd just be annoyed with it. I've only seen the films but if there's no Mark Darcy that seems a shame. I might read the first couple of books but I don't think I'd read this one, given what you've said.